A 5-minute walk from Surasak BTS Skytrain Station, Holiday Inn Silom offers an outdoor pool and fitness centre. It has a health club that provides a tennis court and sauna. Free WiFi is available throughout. 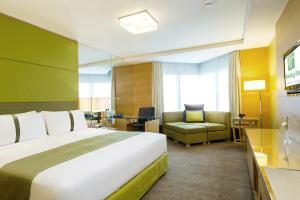 Holiday Inn Bangkok Silom is located next to Jewellery Trade Centre, 2 km from Patpong Night Market. Suvarnabhumi Airport is a 45-minute ride from the hotel. 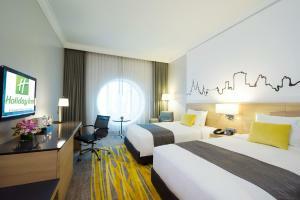 Rooms at Holiday Inn Silom feature soothing pastel décor. They come equipped with cable TV channels, tea/coffee making facilities as well as an iron with ironing board. For travel convenience, Holiday Inn provides car rental and a tour desk. The Brasserie offers both Asian and international dishes, while Orchid Lounge serves a light meal and beverage for 24 hours. Drinks, accompanied by live music can be enjoyed at Hari’s Bar. Please note that bed types and smoking preferences are subject to availability. 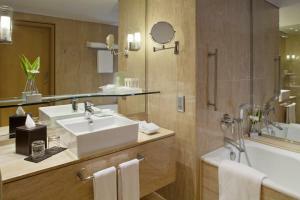 Room comes equipped with tea/coffee making facilities, ironing facilities and a hairdryer. It also has a flat-screen TV and a safety deposit box. Room comes with tea/coffee making facilities, ironing facilities and a hairdryer. It has a flat-screen Tv and a safety deposit box. Rate: THB 2801.26 ... THB 6293.03; select dates below to get current rates. Room comes with a seating area, working desk and ergonomic chair. It also has a safety deposit box and a flat-screen TV. This double room features a bathrobe, electric kettle and seating area. This twin room has a bathrobe, seating area and air conditioning. 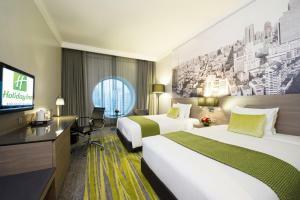 This double room features a flat-screen TV, electric kettle and minibar.